Why Do You Bruise Easily? Okay, let’s get one thing straight right off the back: No. I don’t beat myself up, and no, no one else beats me up. However, when a bruise arises on my skin, I often wonder how it even got there. Most of the time, I’ll remember bumping into a coffee table or banging my knee against an end table. It’s nothing serious, yet the bruise appears within a day or so, and it’s a lot bigger than I expected it to be. After a while, I became aggravated, and I needed to know why my bruises were so much bigger than predicted. Well, I did some research and came to a few conclusions. And, after I realized I could change parts of my lifestyle to avoid easy bruising, I did. So, with that being said, I’m here to warn you about what could cause this constant bruising (or, what could lead to easy bruising). Here goes. Taking certain supplements can cause easy bruising. Always talk to your doctor prior to taking any of the supplements listed above. Easy bruising may be caused because you’re getting older. I know this may seem obvious to you, but sometimes people don’t realize that age has a lot to do with skin behavior. For instance, as you age, so does your skin. This means it gets thinner, and the blood vessels beneath the skin are more fragile. Scientifically speaking, the skin loses surrounding fat that protects it from being easily bruised and blood vessels lose elasticity, making it easier for them to break. Unexplained bruising is very typical for those older in age because of these reasons. Increased bruising may be the result of taking blood thinners. Blood thinning medication can really help people who have an irregular heart arrhythmia. Blood thinning medication can also help relieve the body of blood clots, therefore preventing the body from having a heart attack. The downside? Blood thinning medication makes you prone to more frequent, and unexplained, bruising. In addition, medications like ibuprofen and aspirin can also cause unexplained bruising. Many people don’t realize this, but ibuprofen and aspirin are both blood thinners, too. No wonder they cause more frequent bruising. 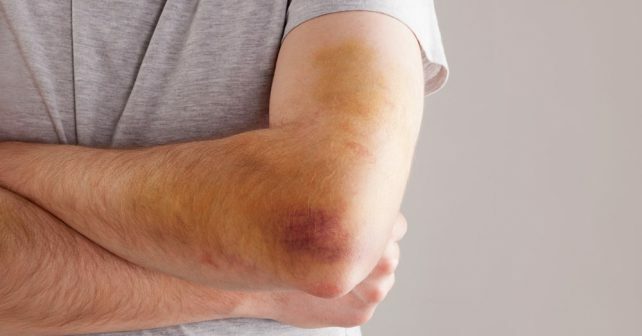 You may have a blood disorder if you keep bruising easily. Hemophilia and von Willebrand disease are two blood disorders you may possibly have if you bruise a lot. Hemophilia is a blood disorder that makes it difficult for the blood in the body to clot. This can be very dangerous considering this disorder can pose very bad dangers to those that have it; A small injury can turn into a huge problem really fast with this disorder. On the other hand, von Willebrand disease is less severe and more commonly found in people than hemophilia is. Von Willebrand disease gives people problems with clotting, but only during certain instances. Such instances include dental visits, long-lasting nosebleeds, blood in the urine or the stool, and heavy and irritating periods in women. If you’re taking antidepressants, you may bruise easily. If you clot easily, you may have a vitamin deficiency. Vitamin C and vitamin K are the two vitamins that can really affect bruising. That is, if you’re deficient in them. If you keep up with a healthy diet, though, this factor shouldn’t affect you in any shape or form. Typically, such vitamin deficiencies only occur in extremely undernourished populations. So, there’s not a whole lot you can do to get a bruise to go away quickly. What’s worse is that bruises can typically take up to two full weeks to heal. Before I give you a few minor tips to help you get rid of that bruise a little bit quicker, I’m going to briefly explain how the healing process works. First, within the first few days or so, your skin turns a blue-ish, purple-ish, or black-ish color. During this time, your blood vessels have leaked out blood. In order for it to heal, your body must absorb the blood that burst from the vessels. While it’s absorbing the blood, it turns either a yellow-ish or green-ish color. This is good. This is supposed to happen. During this healing phase, the body is working its hardest to decrease any type of swelling and to rid the skin of discoloration. The final phase of the healing process should turn your skin a sort of light brown-ish color; That’s when you know the bruise is almost on its way out. However, if you do suspect a bruise coming on, there are a few minor things you can do to quickly speed up the heeling process. Immediately after you bang a body part, or something along those lines, run to the freezer. Grab an ice pack and hold it on the area for approximately 10 minutes. Do this a few times each day until the discoloration goes away. This constricts the blood vessels, therefore slowing down the spread of the discolorations to your skin. 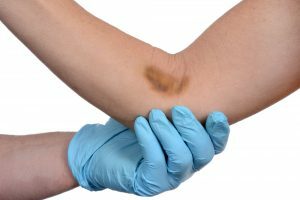 You may still feel some pressure and pain in the area, but the bruise itself won’t be as noticeable.